Alkalinity is a measure of a waters ability to neutralize an acid, & primarily reflects the concentration of bicarbonate (HCO 3), carbonate (CO 3) & hydroxide (OH) ions. 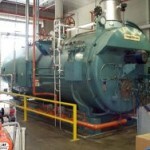 Why is Alkalinity Removal Desirable in Boilers? The more that is present, the more carbonic acid formed in the condensate & the greater the potential for corrosion, & the greater the neutralizing amine costs. Depending on the circumstances, reducing the makeup alkalinity can greatly reduce the potential for carbonic acid corrosion in the condensate return system & the associated condensate treatment costs. A dealkalizer should be considered whenever condensate corrosion cannot be adequately or cost effectively controlled using chemicals alone. Although a minimum level of alkalinity is desired in the boiler water for corrosion & deposit control, high levels can cause a foaming & carryover, & under certain circumstances, can contribute to caustic embrittlement. The boiler water M-Alkalinity level is typically limited less than 1000 ppm to avoid these problems. If the feedwater alkalinity is high, a high blowdown rate may be required to keep the boiler alkalinity within the desired range. Depending on the circumstances, reducing the makeup alkalinity can significantly reduce blowdown requirements & lower the fuel, water, & treatment costs. Dealkalization refers to the removal of alkalinity ions from water. Of the different methods that can be used for alkalinity removal, chloride cycle dealkalization is perhaps the simplest, & can prove to be very cost effective in many situations. Chloride cycle dealkalizers operate similar to sodium cycle softeners. Both use the principle of ion exchange, whereby undesirable ions are removed from water & replaced by desirable ones that are stored on porous ion exchange resin beads, & both are regenerated using concentrated sodium chloride (salt) solutions. However, in a chloride cycle dealkalizer, anion resin is used instead of a cation resin. When regenerated with a concentrated solution of sodium chloride, the anion resin becomes charged with chloride ions. When water is passed over the resin during the service cycle, the carbonate, bicarbonate, & sulfate ions become attached to the exchange sites & an equivalent amount of chloride ions is released. Because this exchange process is considerably slower than in a softener, the service flow rate must be lower (typically 2 to 3 gpm/ft 3), & the minimum bed depth must be greater (30” for a dealkalizer vs. 24” for a softener). A properly operating chloride cycle dealkalizer will reduce the alkalinity of the influent water by about 90%, ± 5% (i.e. from 100 ppm down to about 10 ppm). The chloride level in the effluent will increase by about 1 ppm for every ppm of alkalinity & sulfate removed. Eventually, the resin will become saturated with the anions being removed & the alkalinity level in the effluent will rapidly increase. As a general rule, a chloride cycle dealkalizer should be removed from service & regenerated whenever the alkalinity in the effluent exceeds 10% of the raw water alkalinity. The regeneration process is similar to that used by a sodium cycle softener, & consists of the same basic steps: backwash, brine draw, slow rinse, & fast rinse. Backwash – The purpose of backwash is to remove suspended solids that accumulate on the resin bed during the service cycle. This process expands the bed, releases the solids, & prepares the bed for brine draw. Because anion resin is less dense than cation resin, it must be backwashed at a lower rate to prevent resin carryover to the drain. The backwash flow rate for a chloride cycle dealkalizer should be 2 to 3 gpm/ft 2 of bed area. Do not backwash a new resin bed during the initial start up. Brine Draw – Regeneration can be accomplished using either salt (NaCl) alone, or a combination of salt & caustic (NaOH). The normal salt dosage is 5 to 7 lb/ft 3 of resin. Higher salt dosages do not appreciably increase exchange capacity. However, the addition of 0.25 to 0.50 lb/ft 3 of 100% NaOH along with the brine does significantly increase capacity, as well as convert any free CO 2 gas in the water into bicarbonate alkalinity (HCO 3), so that it can be exchanged by the resin. The addition of caustic during regeneration also has the benefit of slightly increasing the pH of the effluent. During brine draw, an approximately 5% brine solution is directed to the top of the resin bed for a minimum of 30 minutes. As the brine flows downward through the resin bed & to the drain, the high concentration of chloride ions causes the anions attached to the resin to be exchanged for chloride ions. The flow rate should be about 0.5 gpm /ft 3 of resin for optimum regeneration efficiency. Slower flow rates can cause channeling while faster flow rates can cause incomplete regeneration. The caustic is typically pumped from a drum or tank into the system’s brine tank just before the brine draw or into the brine line as the brine is introduced to the resin tank. The water that is fed into the dealkalizer and used for regeneration must be soft (< 1 gpg) to prevent resin fouling. Consequently, a softener is almost always installed ahead of a dealkalizer. Clean, high quality salt must also be used to help avoid resin fouling, which is not easy to detect. Test results will usually reveal poor alkalinity removal, but the cause is not obvious. Fouling is a particular concern where both salt & caustic are used for regeneration. Slow Rinse – When the brine draw is complete, soft water continues to be directed through the resin bed for about 15 minutes at the same flow rate used for brine draw (at least two bed volumes should be passed through the resin). This slow rinse step completes the ion exchange process & pushes the brine from the resin bed to the drain. Fast Rinse – When the slow rinse is complete, a fast rinse at the service flow rate is directed to the top of the resin bed & through to the drain. This step, which lasts about 15-20 minutes, flushes the remaining brine from the resin bed. After completion of the fast rinse step, the dealkalizer is ready to return to service. To properly size a dealkalizer, the water analysis must include as a minimum the following parameters: P & M-Alkalinity, Chloride (Cl), Sulfate (SO 4), Total Hardness, & Conductivity. This information is required to calculate the exchange capacity of the anion resin. Depending on the regeneration method & the ratio of alkalinity ions to the total anion load, the capacity can range from 5,000 to 12,000 grains of alkalinity removal per cubic foot of resin. Ideally, the sulfate & chloride concentration should be less than 50% of the total anion concentration to maximize efficiency & avoid leakage. Note that where caustic is used with salt for regeneration, a minor amount of silica (< 10%) may be exchanged during different portions of the service cycle. The flow rate through the dealkalizer must also be taken into account when sizing a unit. Because the exchange process is slower than in a softener, a lower service flow rates must be used (typically 2 to 3 gpm/ft 3) to avoid leakage. This requires larger tanks & more resin to handle an equivalent flow rate. To meet the requirements of continuous operation, softened water & proper hydraulic balance, a dealkalizer system typically, includes a softener, & must be carefully engineered so that sufficient flow is available to meet process & regeneration requirements. Regenerants are inexpensive & safe. The efficiency is relatively low. A large amount of regenerant may be required, especially at high flows or if the ratio of alkalinity ions to total ions is low. If the ratio of alkalinity ions to total ions is low, the unit must be larger & more resin must be used. There is no total dissolved solids (TDS) reduction. A chloride cycle dealkalizer tends to offer the best payback when the makeup alkalinity is high (> 100 ppm) & the % condensate return is low or when the cycles can be increased. High sulfate & chloride levels reduce regeneration efficiency & the overall cost effectiveness of this method. Regardless of the payback, a dealkalizer should be considered whenever condensate corrosion cannot be adequately controlled using chemicals alone.